Details of the next version of the Android mobile operating system (2.2) are surfacing in advance of the official launch later this month, despite Google's efforts to keep things under wraps. 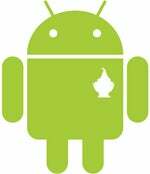 Code-named FroYo (from frozen yogurt), Android 2.2 is the latest iteration of Google's OS named after a desert, following Eclair (2.0/2.1), Donut (1.6), and Cupcake (1.5). Android 2.2 is expected to arrive at the Google I/O conference on May 19 and 20. Phones running Android 2.2 will be able to tether via USB and act as a Wi-Fi hotspot for other Wi-Fi enabled devices, according to TechCrunch. The blog shows screenshots of the FroYo interface, where users can u their Android smartphone to act as a modem, and also share the phone's Internet connection with other devices via Wi-Fi. It's unclear whether carriers will enable USB and Wi-Fi tethering on Android 2.2 for a cost, or if they will allow this to happen at all (note that AT&T hasn't enabled iPhone tethering yet). It would be interesting to though to see whether Google bundles this feature automatically with Android 2.2, without giving carriers an option. If carriers won't enable tethering, then full Adobe Flash support will prove very useful for browsing the Web on an Android 2.2 phone. Andy Rubin, Google's VP of engineering, said in a New York Times interview that Flash will find a home in Android, after it got booted off the iPhone. Overall, we can also expect a sizable performance boost in Android 2.2. The Android Police site claims to have benchmarked Android 2.2 on a Nexus One handset and discovered performance improvements of up to 450 per cent over Android 2.1. It's unclear how Android Police got hold of ForYo in the first place, and it can't be verified that the software they tested is legit. It is also speculated on developer forums that Android 2.2 will let users install applications on an SD card, a popular feature request, especially from those who want to install many apps, but are limited by the small built-in memory of their phone. What we don't know yet though, is which phones will run Android 2.2. The Nexus One is a given first candidate, as it is Google's own phone, but it could take a while for other Android smartphones running customised versions of the OS (like HTC Incredible) to receive the latest update.